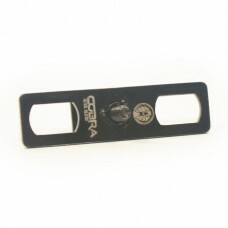 Bij Cobra Tactical Solutions hebben we tweepoten die zowel gebruikt kunnen worden voor de airsoft AEG en sniper als voor uw m4 in .308. We hebben bipods die vast zijn of zijdelings kunnen meebewegen me uw wapen. Sommige modellen zijn vast in hoogte en andere verstelbaar in hoogte in stapjes van ongeveer een 10mm. Via een eenvoudig systeem wordt deze hoogte instelling stevig verankert in de aanwezige groeven. Tactical Bipod Adaptor Mount for Picatinny/Weaver Rail | Black matte | 20mm Rail | Hunting Varmint Air Rifle Shooting Benchr..
Tactical Bipod Adaptor Mount for Picatinny Slot Sling Swivel Stud | Black matte | 20mm Rail | Hunting Varmint Air Rifle Shoo..
Tactical Bipod Sling Adaptor Mount for AR15 / M16 Handguards | Black matte | Hunting Varmint Air Rifle Shooting Benchrest Ai..
[BIPOD] The legs of the bipod extend from 6" to 9". 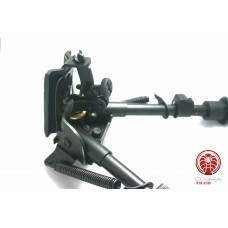 This quick detachable bipod mounts to any available sling swivel stud on ..
Super, we have the product you need! ✓ COBRA Bipods provide an excellent forward rest, steadying the weapon while reducing fatigue and increasing accuracy. ✓ The bipod stows conveniently out of the way when not in use. 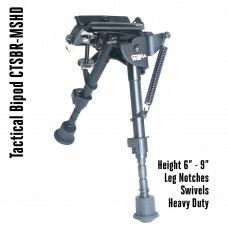 The bipod can be mounted with the legs either forward or backward. Mounted forwards keeps the fore-grip unobstructed. ✓ Made of hardened steel and aluminum, non-rust black anodized finish. ✓ The head of the bipod can swivel 20° degrees. ✓ High quality rubber on the bottom of the leg makes the bipods shockproof and antiskid. ✓ The base of the bipod is fit with a thick rubber, which acts both as a shock silencer as prevents scratches on your rifle. 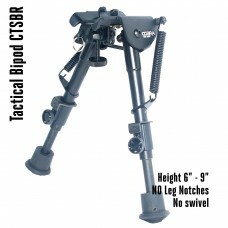 Leg Notches: Leg notches provide an easy way to adjust the height of the bipod in even steps. This is the best option for indoor or range shooting. If shooting in a place where the terrain is uneven, the fine adjustment is preferred. 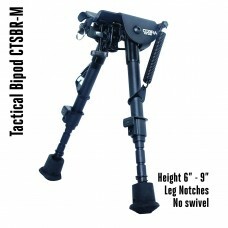 Swivel: A bipod that can swivel allows to tilt the rifle from side to side. 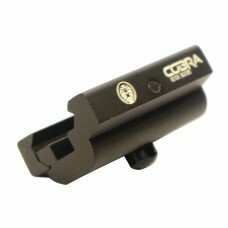 This makes it easy to get the rifle perfectly level on uneven terrain. Even a small amount of rifle cant can result in a miss at long-range. Snipers stay low to the ground to reduce the change of being spotted. 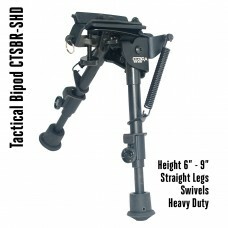 A swivel height of 6″ to 9″ is the most popular and best bipod height. When prone shooting, depending on your stature and how flat the shooting ground is, bipods with height 9" to 13" will do the trick. What if you’re shooting off a bench? The perfect bipod height for this job ranges from 6 to 9 inches. ✓ We have multiple styles of bipods, mounts and riser that can be used for Hunting, Varmint, Air Rifle Shooting, Benchrest, Airsoft .